As Azerbaijan enjoys its relatively newfound status among oil- rich nations, it’s looking to join the seemingly endless race to construct the world’s tallest tower. Azerbaijan’s Avesta Group has announced that they are hoping to build a $2 billion, 3,444 foot tall tower in the former Soviet Republic. This would place it at 720 feet above present title holder, the Burj Khalifa Tower in Dubai. Its height will also surpass that of Saudi Arabia’s 3280 foot Kingdom Tower, which is still in development with completion slated for 2017. Plans unveiled for the kilometer high tower show that it will take the form of a cluster of cylinders located around a lofty central core. 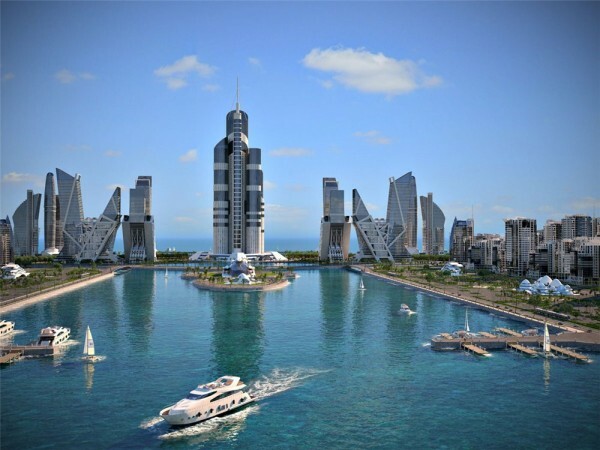 Azerbaijan Tower will be the centerpiece of a $100 billion mixed use development project on the man-made Khazar Islands. Plans for the chain of 41 islands, located in the Caspian Sea off the coast of Baku, are about as modest as the proposed tower. 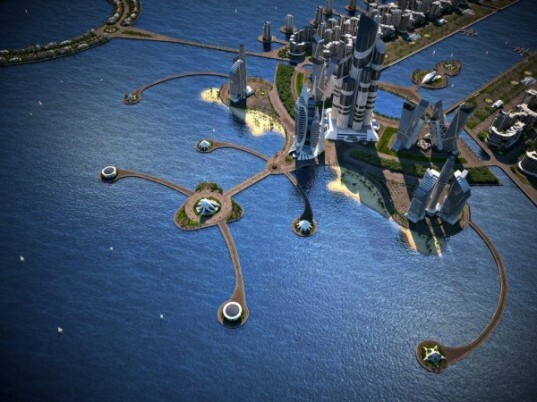 With island-building scheduled for completion in 2022, Khazar Islands will provide accommodation for one million residents, and will include over 150 schools, 50 hospitals and its own Formula 1 race track. No word yet on if this tower will include any green features. Developers do claim, however, that it will able to withstand a 9.0 magnitude earthquake. With plans to break ground on Azerbaijan’s island tower in 2015 and complete construction by 2019, it looks as though Jeddah’s Kingdom Tower may still have a couple of years to enjoy its moment in the sun. Looks like missile weapon, design is horrible. This World's New Tallest Tower is so adorable! It is gonna make Azerbaijan very unique and famous in the World!!! This... better be a joke, that is the stupidest looking building I have ever seen, like some sort of NASA/PowerRangers lair... wth. As Azerbaijan enjoys its relatively newfound status among oil- rich nations, it's looking to join the seemingly endless race to construct the world's tallest tower. Azerbaijan's Avesta Group has announced that they are hoping to build a $2 billion, 3,444 foot tall tower in the former Soviet Republic. This would place it at 720 feet above present title holder, the Burj Khalifa Tower in Dubai. Its height will also surpass that of Saudi Arabia's 3280 foot Kingdom Tower, which is still in development with completion slated for 2017.